I'm the first to admit that I know almost nothing about French cooking. Sure, France is the birthplace of all things culinary, but it isn't really my style. Too many rules, too many "techniques." Cooking for me is much more Italian, Mediterranean, or Indian: a pinch of this, a bit of that, toss it together and dig in. I think, though, that it is time for me to confront the French beast. I've been reading the wildly popular blog Chocolate and Zucchini, which is about as French as French can be, in my opinion. The cute creator/writer/hostess/chef, Clotilde, is petite and cheerful and loves to entice her readers with tales and photographs of butter-rich sables, creamy fig glace, and all manner of enticing tarts. I recently happened upon her cookbook (also called Chocolate and Zucchini) at a local bookstore and couldn't resist buying it. Thus my cookbook-buying bender continues, and I am obligated to add a little French flare to the kitchen. In all seriousness, though, this dish is just right for breakfast, brunch, or, I suppose, dinner - as long as it's not the only thing you are eating. To make the eggs, add them carefully to a pot of boiling water. When the water starts boiling again, set your timer for four minutes and cook at a gentle simmer. 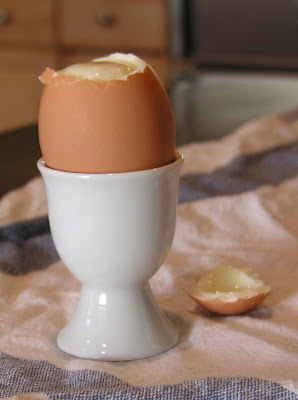 Immediately remove eggs, rinse with cool water, and serve in precious little egg cups, like the ones we just bought specifically for the photographs in this post. 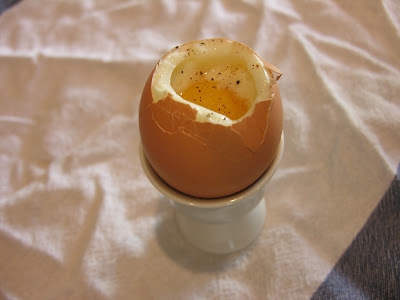 To eat the eggs, tap a knife around the top of the egg, cracking the shell gently. 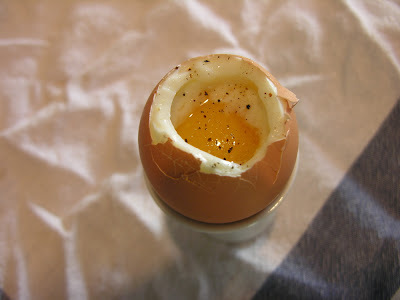 Pull off this little hat of egg shell, and season with salt and pepper. Eat with a small spoon, or by dipping pieces of bread into the egg. You are bound to feel very sophisticated. Almost French, I'd say. Do you have an egg timer? As a child, one of the joys of eating a soft-boiled egg was the egg timer. My mother would put the egg in the pot and I would get to turn over the egg timer. She would take it out, remove the top just so, and serve it to me in an egg cup. It had to be cooked perfectly or I would not touch it. If the yolk had hardened at all, I would not eat it, but if it were too runny, it would be equally unappealing. Riddle: What timepiece has the most parts?